The FIFA World Cup is an international football association competition which is held every four years. Contenders come from the Federation Internationale de Football Association (FIFA) senior men's national teams, and there can be more than 200 qualifiers for any given World Cup. The championship is awarded every four years during the World Cup Finals, with a qualification phase running the previous three years. The World Cup Finals last about a month, played at several venues in the host country. The World Cup is a widely popular event around the world and is quite likely the most anticipated opportunity for legally betting on soccer. This year’s tournament is in Russia and begins on June 14th, 2018. 8 different national teams claimed the first 20 World Cup titles. Brazil has been the most successful with 5 titles, and is also the only country to have played in each and every tournament so far. Italy and Germany own 4 World Cup titles. Argentina and Uruguay have won the soccer championship 2 times each. Spain, France and England all hold one title apiece. As an international competition, the World Cup final is always one of the most viewed sporting events in the world. The FIFA World Cup qualification stages are global events, required to trim the huge international field to 32 finalists. The 6 identified FIFA continental zones of Africa, Asia, North and Central America and Caribbean, South America, Oceania and Europe are run by respective confederations. For each World Cup tournament, FIFA ranks the relative strength and numbers of every confederation's teams, and then decides how many spots will be awarded to each continental zone. This is a long and thorough process. 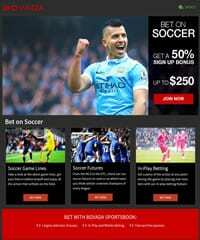 This page was created specifically for soccer fans interested in betting on the World Cup. Russia will be flooded with international fans come June. Match Day 1 kicks off on June 14. The World Cup Final will be held on July 15 at the Luzhniki Stadium in Moscow. That is just over a month of betting action. This site has information on where to legally bet on this year’s World Cup, the legalities of offshore betting and insight into the odds for the 2018 World Cup. Easily a multibillion-dollar enterprise, betting on the World Cup online is popular in many countries where soccer is the premier sport of the day. All over the United Kingdom and South America, there are outlets for residents to legally place World Cup bets online on their favorite teams. In the United States online sports betting is illegal, if delivered by a company which is owned and operated in the US. However, legally licensed offshore websites which have been offering online World Cup betting and wagering on other sports for years continue to do so. This provides United States citizens with legally accessible and reliable internet options for betting on the World Cup qualifying stages, as well as the finals. Access for US players to legally gamble on the exciting World Cup is offered through the top rated sportsbooks we recommend here on our site. While there are quite a few reputable sportsbooks currently offering world cup betting action, we strongly recommend USA Players choosing Bovada. They are a fantastic site with a perfect reputation, so there just isn't much value in US players going anywhere else. Especially considering Bovada offers the best lines, the most FIFA props, free brackets and a host of other perks that really make playing exclusively at Bovada a no brainer. New players can claim their special 50% bonus up to $250 to bet on various world cup matches. They also offer casino and poker software to enjoy under one account. Legally betting on the World Cup is now possible through legitimately certified and registered offshore websites. In countries like the US where sports betting can not be legally offered by state or federally run companies, legal online sports betting is accessible through established companies like Bovada. Soccer (called football in most parts of the world other than the United States) claims some of the most rabid and fanatical fans in the world. Because of this, the legal online betting access offered 24/7 to all countries of the world from a smartphone or PC meets with heavy World Cup wagering every four years. The 2018 World Cup has finally reached an end. France defeated Croatia with a 4-2 victory in the Final. Out of all the favored teams, France were the only one left when everything was said and done. Croatia were never considered true contenders before the tournament started, showcasing that underdogs can in fact prove oddsmakers wrong. France got off to a lucky start in the World Cup when Mario Mandzukic gifted them with an own goal. Croatia’s Ivan Perisic equalized shortly after with a slick move and shot. France were awarded a penalty when Perisic deflected a corner with his hand; Griezmann converted from the spot to put them up 2-1 at halftime. France piled on it on the second half with goals from Paul Pogba and Kylian Mbappe. Croatia started a comeback when Mandzukic capitalized on a goalie error, but Croatia ran out of time and the game finished 4-2. In the third place game, Belgium dominated England for a second time. This time around both sides fielded their starters. Belgium finished the game 2-0. They made a strong case for a World Cup contender, but third place will have to do for now. The World Cup Semifinals saw France versus Belgium and England against Croatia. France were able to park the bus after going up 1-0 thanks to a corner kick header. Belgium couldn’t find an answer and France moved on to the Final. England and Croatia played out an exciting match that went to extra time after a late equalizer from Croatia. Croatia continued their aggressive play and got the go-ahead goal in the 108th minute. This sets up a rematch of the 1998 World Cup Final with France against Croatia. France bested Uruguay 2-0 in a dominant matchup. Belgium were able to see off Brazil in a 2-1 victory despite an almost amazing comeback from Brazil. England had a strong 2-0 win over Sweden. Russia and Croatia played out an exciting game that had 2 equalizers, including one in extra time. Croatia won the penalty shootout to move on. These games set up a France-Belgium and England-Croatia semifinal. The World Cup Round of 16 was full of action. France played out a dramatic 4-3 victory over Argentina. Uruguay bested Portugal, sending Cristiano Ronaldo home in the process. The host nation Russia beat the odds after defeating Spain in the tournament’s first penalty shootout. Croatia followed suit after beating Denmark in a close penalty shootout. Brazil defeated Mexico after 2-0 despite a strong performance from the Mexican side. Belgium and Japan had the most intense game of the week. The Belgians were able to come back from 0-2 down and score the winning goal in the last few seconds. Sweden and Switzerland played out the slowest game of the round, with the Swedes able to top Switzerland by a 1-0 margin. England and Colombia had a scrappy fixture. The Three Lions won the penalty shootout to send Colombia packing. The World Cup Group Stage has come to an end and there were several points of interest throughout the closing phase. Uruguay gave Russia its first taste of strong competition and its first loss of the tournament. Spain and Portugal narrowly escaped their group with Iran and Morocco clutching on until the end. France and Denmark made it out of their group after the tournament’s first and only goalless draw so far. Argentina defied the odds and beat a promising Nigeria team to join Croatia in the Round of 16. South Korea defeated Germany to give the defending champions an early World Cup exit. Despite the victory, Sweden and Mexico advanced out of the Group of Death. Switzerland and Brazil did what they needed to do in order to push through to the next round. Colombia saw off a talented Senegal team with some help from Poland’s win over Japan (it didn’t help Poland’s case as they were eliminated). England and Belgium waltzed out of their group after playing a semi-boring match with their B-teams. Week 1 of the World Cup was jam-packed with action, though some moments stood out more than others. Portugal and Spain played out an exciting 3-3 draw with Cristiano Ronaldo scoring a hat trick. Germany, the defending champions, failed to win against a promising Mexican side. Brazil tied with Switzerland, hindering their chance at finding an early rhythm. In another surprising turn of events, Argentina drew against Iceland. Winning sides include Russia, Uruguay, Iran, France, Denmark, Croatia, Serbia, Sweden, Belgium, England, Japan and Senegal. It is apparent that this World Cup is anyone’s tournament to win. The first games are a chance to soften any rough patches and establish some type of cohesion on the pitch. For some teams, there needs to be more work done in those regards. Other squads look ready to challenge for the title of best in the world. The World Cup features the most talented soccer players in the world. Soccer is referred to as “The Beautiful Game” and these players help contribute to that title. We here at Legal Betting Online are such fans of the game that we wanted to construct a page focusing on our own World Cup MVP Award. To reiterate, this is not an award given out at the tournament like the Golden Boot, Golden Glove or Golden Ball. This award is based on the best overall performance throughout the tournament. There are a few significant players this time around that have a lot of potential. We want to highlight them with our own award. Be sure to check back to this page throughout the tournament, as we will be updating it with breakout performances as the tournament progresses. There are hundreds of players that will be at the 2018 World Cup. However, out of these hundreds, we are still able to pick out a few that will have a strong impact on the tournament—that is how good they are. These players have shown promise since the early onsets of their careers. From then on, they have put on historical performances for both club and country. Watch out for these players in the 2018 World Cup. Neymar is one of the youngest talents in world soccer. The Brazilian currently plays for Paris Saint-Germain and was with Barcelona before that. He has scored 40 international goals in just 50 caps, making him one of the country’s most successful players in history. What makes Neymar so alluring is how he plays. He has the typical Brazilian flair but taken up a notch. Neymar makes his opposition look like youth soccer players. His speed is practically unmatched and his free kicks are something to behold. Neymar does suffer the woes of being a young talented player in terms of being selfish at times, but he has matured over the past couple seasons. He suffered a back injury during the 2014 World Cup that saw him take an early exit, crushing his hopes of lifting the trophy on his home soil. Now, he has his health and a renewed focus on winning the tournament. The world of soccer is lucky to have Messi. Arguably the greatest player in the world, Messi continues to blow people away with his performances year after year. The Argentinian plays for Barcelona and has enjoyed much success with them. His national side seems to be cursed when it comes to major trophies, as the country has yet to win a World Cup or Copa America with him in the lineup. That just goes to show how soccer is a team game. While Messi may be the best on the planet, he still relies on his teammates like any other player. Messi has a total of 61 international goals for his country. His dribbling skills are out of this world and his left foot has produced some of the most beautiful free kicks anyone has ever seen. Messi is approaching the twilight of his career, but he has continued to improve and refine his craft. Messi will be on full display in Russia and he will likely leave it all out on the pitch since this may be his last international tournament. Ronaldo is held at the same level as Messi as far as the “most talented player in the world” debate goes. He plays for Real Madrid and has helped contribute to their all-time leading records in both La Liga and the UEFA Champions League. Ronaldo has also never won a World Cup, but he helped Portugal claim its first Euro Cup championship just 2 years ago. Ronaldo is a prolific scorer with 81 goals for his country. He has a wicked shot that can curl in from any angle. It is particularly lethal on free kicks. Ronaldo will be in good health for the World Cup barring any injuries in the Champions League final. He is the go-to guy for the Portugal squad, meaning most of the offense flows down his left flank. His dribbling skills are not quite at the level of Messi’s, but Ronaldo has no problems getting past most opponents. At this point in his career, Ronaldo serves as the captain of the team and as a leader. His experience should help him in his quest to lift his first World Cup trophy. Belgium may very well have the best squad they have fielded in some time. It is mostly the same players, but they have matured into incredible players. De Bruyne is the perfect example of this. The young midfielder just had an incredible title-winning season with Manchester City in England. His engine is impressive and De Bruyne has provided some of the best passes and crosses seen in recent years. He has developed into arguably the best current midfielder and will be the conductor of Belgium’s play in the World Cup. If Belgium has any success in this tournament, De Bruyne will be a major contributing factor. A soccer team cannot perform well without an adequate midfield. De Bruyne has emerged as a frontrunner in the position and has it what it takes to put on a show this time around. The top 2 favored teams are Germany and Brazil. Germany is the defending international champion and Brazil is always considered amongst the top rated. France is another country projected to do well, and they should with their talent-laden roster. Spain and Argentina are the next 2 teams listed in most sportsbooks. Portugal just won the Euros in 2016, but the odds of them winning this year’s World Cup are not as high as people may expect. Portugal has yet to win a World Cup in the Cristiano Ronaldo era, and with the superstar getting older, this may be his last chance to prove something. The same can be said about Lionel Messi with Argentina, and although Messi is a tad younger than Ronaldo, some expect him to retire from international duty after this tournament. Other teams to watch this year are Belgium, Croatia, Iceland (which surprised everyone in the Euros by advancing as far as they did), Mexico, Colombia and Uruguay.